"I just wanted to let you know again how much I enjoyed your class last September 15th. I was rear ended in a car accident 2 1/2 years ago--ended up having some cervical disks fused because of the pain--and still am not able to do what I could do before the accident. 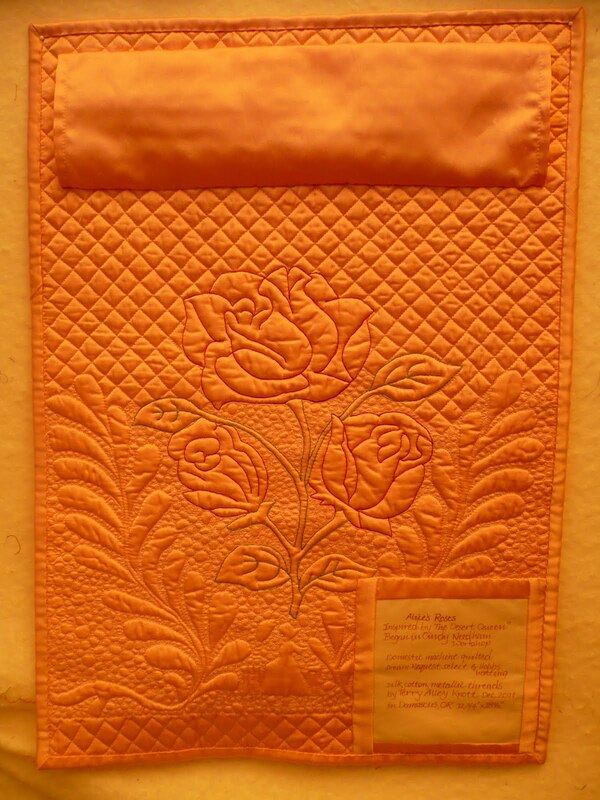 I treasure the quilting time I'm able to do. I chose a small project because I hoped I could finish marking it before I the pain caused me to stop working. Here's my update. Today, I finished the project. 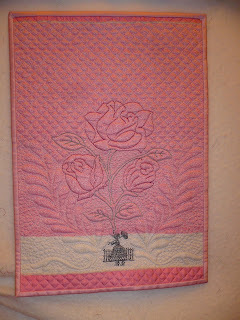 I used silk and metallic threads on the front of the quilt and Masterpiece on the back. I also used Kaufman's Radiance for the backing and for the batting I went with the Quilter's Dream Request/select with a split layer of Hobbs wool batting. It was perfect. 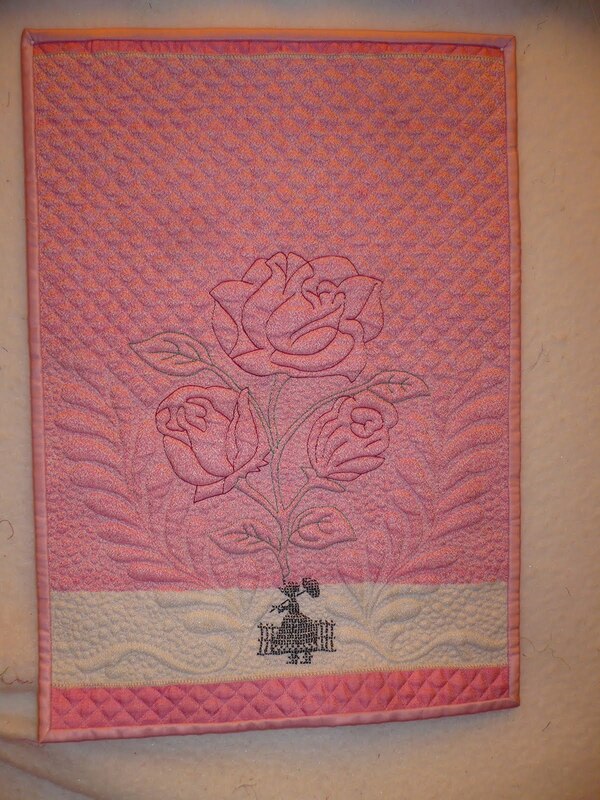 I belong to a quilting book club, where we read a book then make a quilt. (We make about four quilts a year.) 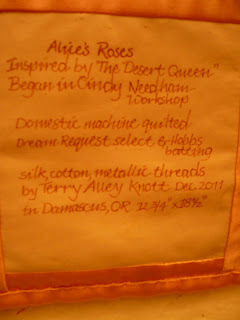 Our current book is "The Desert Queen" by Janet Wallach and the motif on this tea towel was my inspiration. The book was about how a British woman, Gertrude Bell, defined the borders of Iraq after the first world war. Our reveal isn't until January, but it is nice to finish before the deadline which doesn't happen often! 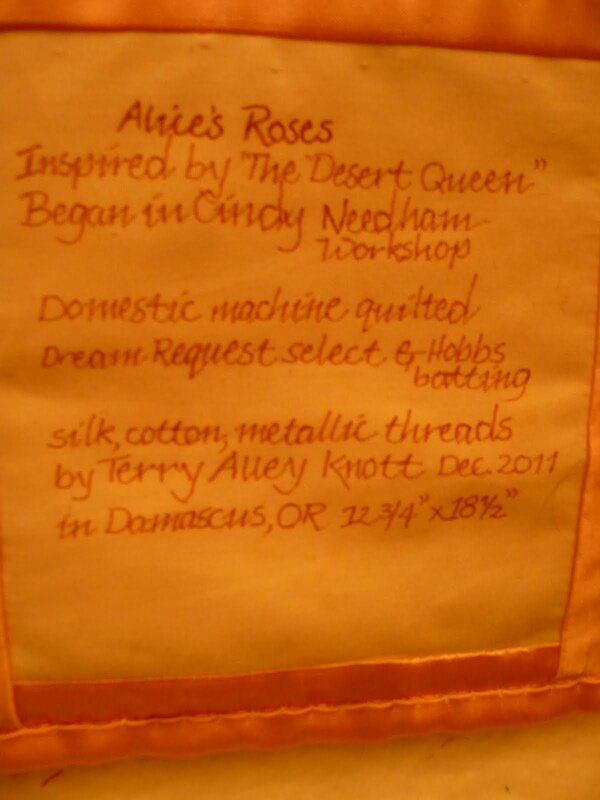 The final destination for this piece will be a gift back to the person who gave me the linen. She, Alice, was part of my water aerobics class for many years and we have had many a potluck breakfast at her house. She grew the most wonderful roses and when she was younger, was a working woman who managed a large bank in Portland at a time when women just stayed home to raise the kids. I wonder if she will recognize the tea towel now?!" I am so honored to be a part of your blog! Thank you so very much! 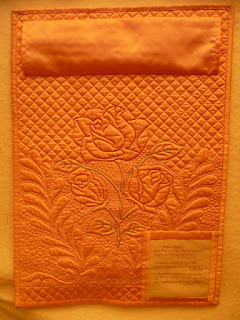 Wow, is this Rose FMQ spectacular or what? Love it. Thanks for sharing. Terry did a fantastic job. Absolutely inspirational. Wow, such nice work - that's amazing! It's hard to believe it's a tea towel. Your friend Alice will be gush with admiration when she sees this. You are very talented!